Planapple: Yeah, but what does everyone else have to say? Oh, and while we're working magic, we've also started automatically filling in missing contact info (phone number, official web site, contact email) for places you bookmark. This new feature is experimental, and we expect it to get better over time. 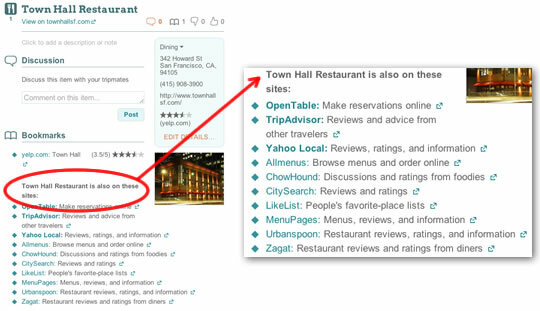 Right now, it works best if you originally bookmarked a place from Yelp, TripAdvisor, Lonely Planet or CitySearch. It's primarily for commercial establishments like hotels, restaurants, and other businesses -- although it also knows some parks and museums. And coverage is generally better for places in the U.S. and Europe than elsewhere right now. If the additional links don't show up for an item, it either means we couldn't recognize the place you've bookmarked (try setting its address if there isn't one there) or that we couldn't find any other links for it. Let us know what you think, or if you find any problems with the links and contact info we're adding. Happy planning!